Campaigners have scored a victory to save their recycling centres – at the expense of the service offered at nearly a dozen across the region. Aberdeenshire Council revealed it has now made a U-turn on closure plans and will retain the Insch and Portsoy recycling units, but will slash the opening hours of 11 more. And in a further cost-cutting move, the local authority could roll out plans to reduce bin collections to every three weeks. The proposals would save £500,000 of the £20 million the council is trying to claw back. Members of the infrastructure services committee will consider the proposals next week. But campaigners said although they were pleased their recycling centres could remain open on Tuesdays and Saturdays, they challenged the idea it had come at the cost of other facilities. 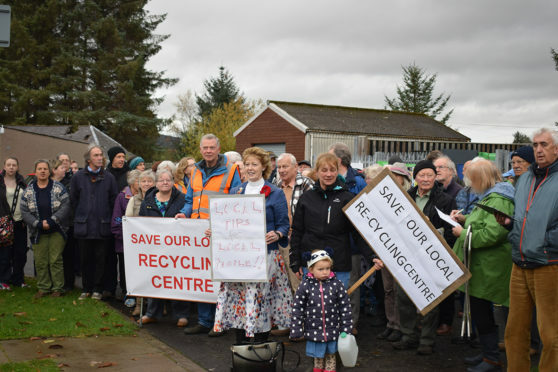 Rod Lovie, from Portsoy Community Council, said: “To say that for Portsoy recycling centre to stay open means other centres opening hours have to be cut is disingenuous at best and downright lies at worst. “According to the report the changes to the recycling centres are cost neutral. Councillors will consider the recommendation to reduce the existing fortnightly bin collections to every three weeks at an infrastructure services committee meeting. Previous proposals to close the recycling centres are no longer being considered. Recycling bins would also be incorporated into the new cycle, together with a weekly food waste collection. The council hopes the move will take about 17,000 tonnes of rubbish away from landfill by forcing people to recycle more. However, a public consultation carried out last September found that 49% of people would prefer to retain their fortnightly collections. And last night Phil Mills-Bishop, who is the co-ordinator of the Stonehaven and North East Scotland Twinning Group, said he “could not understand the logic” of the proposals. Mr Mills-Bishop, who also lives in the town, helped to co-ordinated the Mearns town’s linking with French town Acheres and Athens in Alabama, America, last year. He said: “Obviously I’m concerned as a resident if this means rubbish is going to be piling up in bins and not collected for three weeks. “But it’s also going to affect how visitors and tourists see the town – I have been involved in that side of things for a while and I’m struggling to see the benefits of this change. If approved, the bin collection changes would be introduced in 2020, while the changes to the recycling centres – which involves each of them closing half an hour earlier Monday-Thursday and an hour earlier on Fridays – would come into force later this year. A council spokesman said: “Changes to kerbside services have been proposed and, out of the two options consulted on, councillors are recommended to choose the option which will give residents a 180 litre non-recyclable waste bin to be emptied every three weeks. “Although a different option was more popular in the consultation, professional advice is that the alternative is most likely to encourage residents to recycle more and send less waste to landfill. Aberdeenshire Council is currently examining ways to save £20million. Meanwhile, Aberdeen City Council is also looking to save millions, and will be unveiling its cost-cutting proposals in the coming days.